How would you feel if you see a blank status update from someone? You can’t write a blank status update by simply pressing the Space key and then clicking on Post button.Instead you have to use special codes to write a blank character in your Facebook status. Follow the steps to post Blank Status.!! 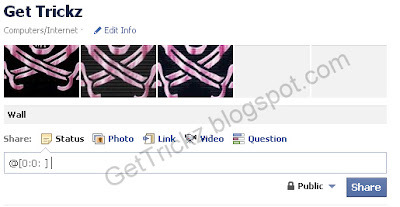 Step 2: Copy the text @[0:0: ] in your status and share it. That’s it. Now you can post blank status.. Enjoy & Keep watching on GetTrickz.